I did a smaller version of this painting for the Noodle Box. I really enjoyed doing it and it turned out so well that I decided to do a larger painting. This one however will go off to Madrona Gallery. This is another pour where I layer a resist (masking fluid) and watercolor paint. The watercolor is poured across the paper and creates a beautiful glow. It is always magical to see what will happen. If interested in purchasing, please contact Madrona Gallery. 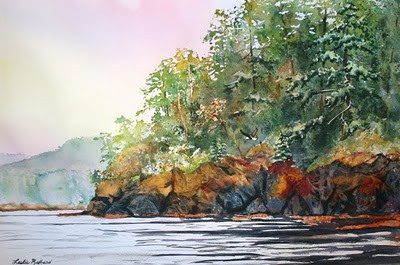 I just returned from teaching a workshop at April Point Resort on Quadra Island this past week. The above painting is one that I taught the class how to do. We did washes of color and then had a little fun splattering the paint (some had a little bit too much fun by the looks of them and their neighbors!) The image is of a typical scene from the island. The views really are breathtaking. It was a great group of painters of all different skill levels that I taught. I feel like each one came away with a beautiful painting of their own. I will be teaching in the area again September 19-21. 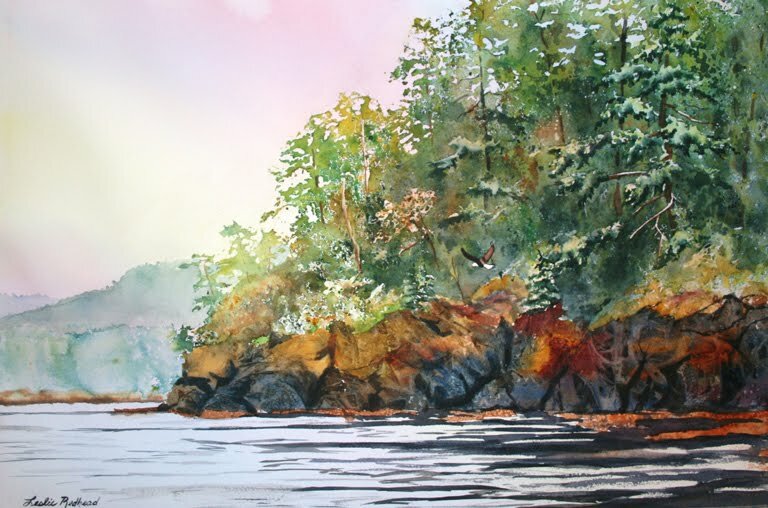 This time it will be at Painter's Lodge, which is the sister resort to April Point on the Vancouver Island side. For more information, please contact the Oak Bay Marine Group. To purchase the painting, please contact me or go to my Etsy shop. Birch Bay Boats, watercolor, 7.5x10"
This one is for my Thursday class. I had a great time teaching you. Now that we have mastered water, it is time to do skies! 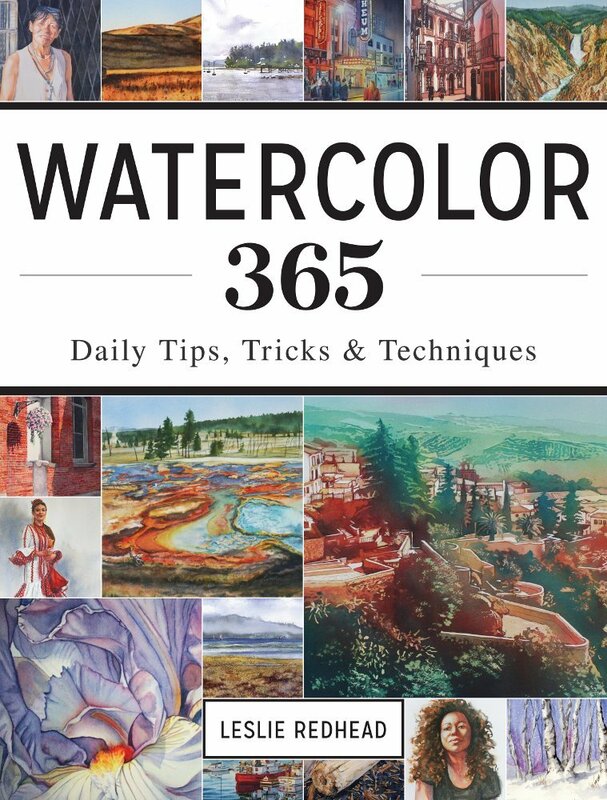 Look in the Monterey Centre fall catalog for my course on how to do Dynamic Skies in Watercolor. See you in September or in one of my summer courses. Rushing creek demo for my water class. The photo was taken on a trip to Tofino. I painted this landscape of Uplands Park in Victoria, BC for my landscape class. It is available for purchase through my Etsy shop or email me. 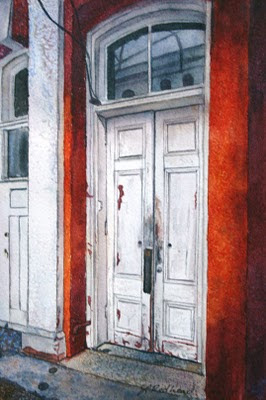 The Door Between, watercolor, 7.5x10"
A number of years ago I did a series of door paintings. I have always enjoyed looking at doors and wondered what they lead to and the stories that go with them. This door is in Victoria's Chinatown. It was tucked between two shops and is quickly missed. As I walked by it I wondered about the families that most likely passed through these doors over the years. It was fascinating to me and I decided to paint is as part of the show for the Noodle Box. After the Rain, watercolor, 7.5x10"
This is the final painting I did at my workshop. The demo was of a rainy sky and how to paint driftwood. To purchase, please visit my Etsy shop or email me. In The Garden, watercolor, 7.5x10"
This is another painting I did for my workshop. It was done in the garden of the Ocean Wilderness Inn. There was so in bloom and so much to paint that it is hard to simplify. We chose the garden instead of the ocean for the challenge and because the warmth of the sun was on this side of the Inn. I found it harder to do than a simple beach scene. I think I was the only one that completed a painting. Good thing since I was the instructor! Along the Shores, watercolor, 7.5x10"
This painting was one I demonstrated in my workshop in Sooke. We did this the first day of the course. I was trying to get the class familiar with a typical west coast scene. It is the view from the bottom of the stairs at the Ocean Wilderness Inn. My daughter and I went for a walk early Saturday morning. We only met one person with her dogs. Heard there was a bear but fortunately missed him, although the Yorkie terrier was pretty growly. 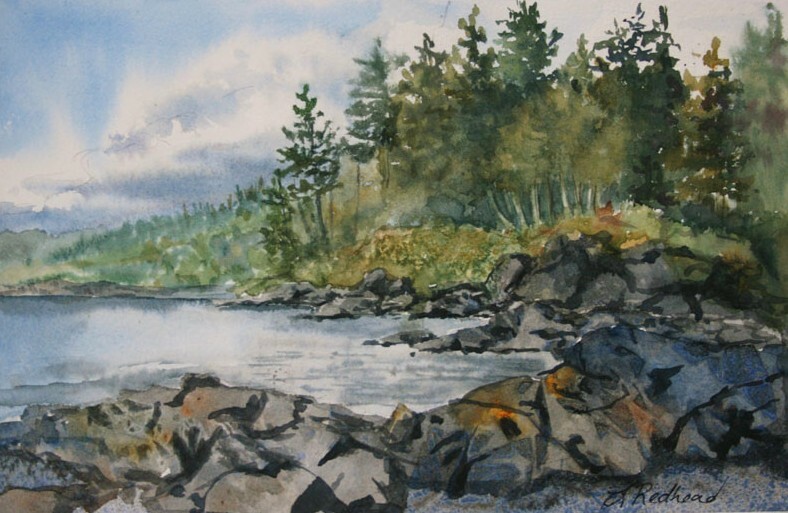 Rocky Coast at Point No Point, watercolor, 7.5x10"
This past weekend I taught a workshop in Sooke, BC on Vancouver Island at the Ocean Wilderness Inn. The workshop was plein air landscapes. We were fortunate enough to have perfect weather. It was sunny, warm, and no wind! We spent Saturday morning painting in the gardens of the Ocean Wilderness Inn and the afternoon painting on the beach at Point No Point Resort. The above is the painting I did while sitting on the beach. It was a treat to spend the afternoon painting such a beautiful location. If interested in purchasing, please email me or go to my Etsy shop. This is a photo of my view that I painted. One of my students happily painting away. That is my easel in the center of the photo. She ended up painting me into her scene! More of the attendees setting up to paint with a different view. The bridge out to the Point. We didn't quite make it there with all our painting gear. There was too much to paint along the way. Maybe next time. The Swimming Hole, watercolor, 7.5x10"
I completed this painting this morning. It is part of my series on water. 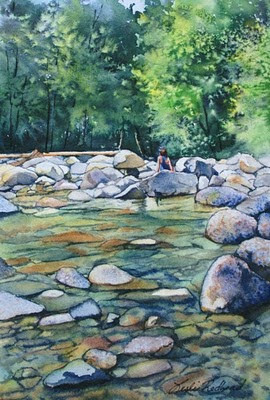 It is of a creek in North Vancouver, BC where my sister-in-law took me and the kids swimming. Beautiful area. It is a rainforest located in the middle of the suburbs of Vancouver. 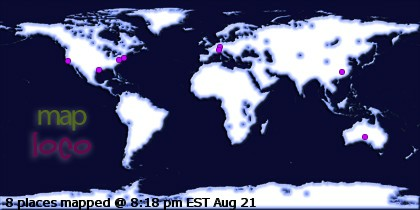 Something I have not seen before since I am originally from the East. Only problem was the suspension bridge. It wasn't Capliano but it was still too high for me to feel comfortable. Market Day on Fisgard, poured watercolor, 7x10"
Since my Noodle Box Painting sold at The Noodle Box on Friday, I was asked to bring in another painting. This was one that I had started but didn't have a chance to finish. So I quickly finished it and took it off to the restaurant yesterday. 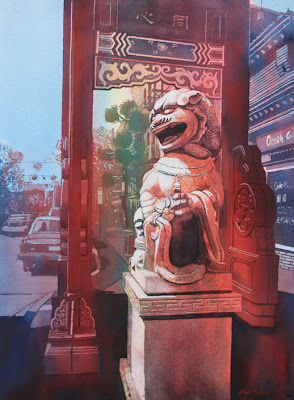 Now I need to start painting more Chinatown pieces in hopes that another one will sell soon. This painting was a demonstration for my landscape class. It is a short course so trying to fit in everything I want to teach has been a challenge. This lesson was on rocks, sand, and water. The photograph was taken from Quadra Island looking towards Campbell River on Vancouver Island. My son named the painting. To purchase, please go to my Etsy shop or email me. I received a wonderful call yesterday. One of my paintings had sold at The Noodle Box! Thank you to Nick for the purchase and the wonderful opportunity to show at such a great location.